Have you purchased meat from Rawhide Meat Processing in Jamestown? If not, you do not know what you’re missing. They offer a wide variety of USDA Choice meats and their meat is so fresh, clean and delicious. 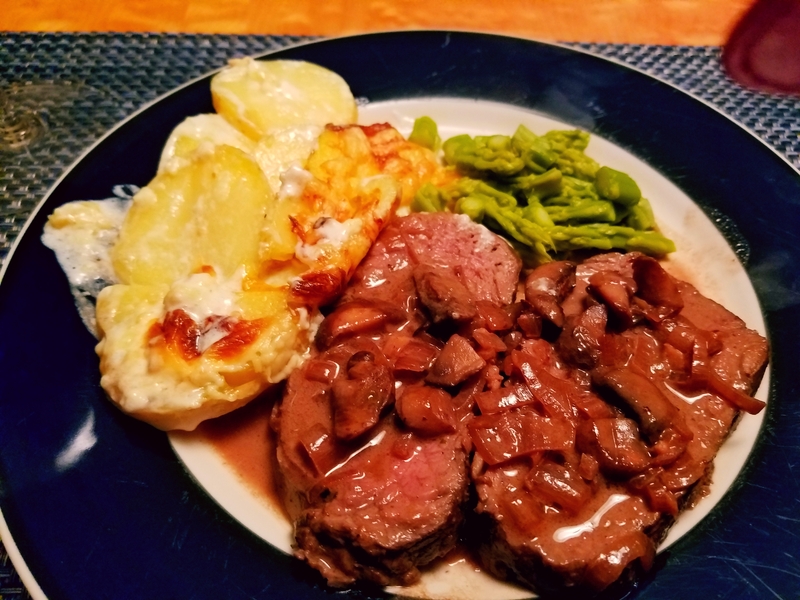 Charlie has been wanting me to make a nice chateaubriand so he called Rawhide and asked for a center cut beef tenderloin…but, he wanted it fresh from being butchered as opposed to frozen. No problem, they would give us a call the next time they had freshly butchered meat. About a week or so later, Charlie got the call. On my way home I picked it up and the next night we enjoyed Chateaubriand with a decadent mushroom wine and cream sauce, scalloped potatoes and asparagus. It was heaven. If you would like a copy of the recipes shoot me an email or give me a call. I’d be happy to share. robin@tuolumnehomes.com or 209-536-3000. This entry was posted on October 23, 2017 by Robin Rowland in Food, Fun and tagged Berkshire Hathaway HomeServices, food, Good Eats & Drinks, rawhide meat, tuolumne county.